DNG Ella Dunphy are delighted to present to the market this three-bed semi-detached home in immaculate condition throughout with the added bonus of private parking, beautifully landscaped south facing garden. 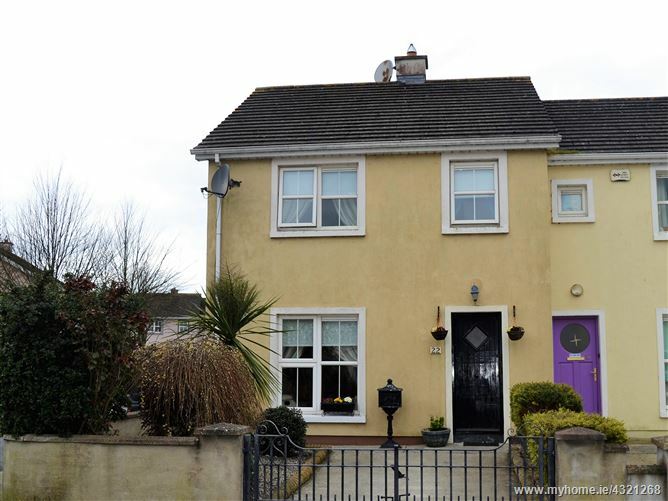 Nestled in the well-established mature residential area of St. Kierans Crescent. No 22 is within walking distance of the Shopping Centres at Newpark & MacDonagh Junction and a 10-minute walk of the City Centre. This ideally positioned property will appeal to first time buyers, families and investors alike. This attractive home needs to be viewed to truly appreciated. Bright traditional style entrance with doors to kitchen, living room and under-stairs guest wc. Good storage options. Laminate flooring. Tiled floor. Classic white wc & whb. Warm family sized reception room. Open fireplace with granite hearth, cast iron inset and solid timber mantelpiece. Double doors to kitchen/dining room. Roller blinds. Tv point. Open plan kitchen and dining room. Great selection of floor and eye level kitchen units. Laminate countertop with tiled splashback. Integrated electric hob and grill. Gas boiler located here. Includes matching breakfast bar and French door to sun room. Laminate flooring. Large sliding doors on both sides. Timber cladded walls and ceiling. Solid timber post & rail stairs leading to landing space. Laminate flooring. Hot press located here. Large double room. Laminate floor. Roller blinds. Attic accessed here.